TGIF, dear readers! This week has certainly felt like a long one since last week was so short, and I am so happy that the weekend is just about here! I'm sure I'll be singing a different tune soon as it gets closer to Christmas and I hit crunch time trying to finish up gifts I am making this year. I currently have 10 different projects in various stages of not-yet-done, and I am hoping to get a couple of them finished this weekend. Now on to today's blog post! 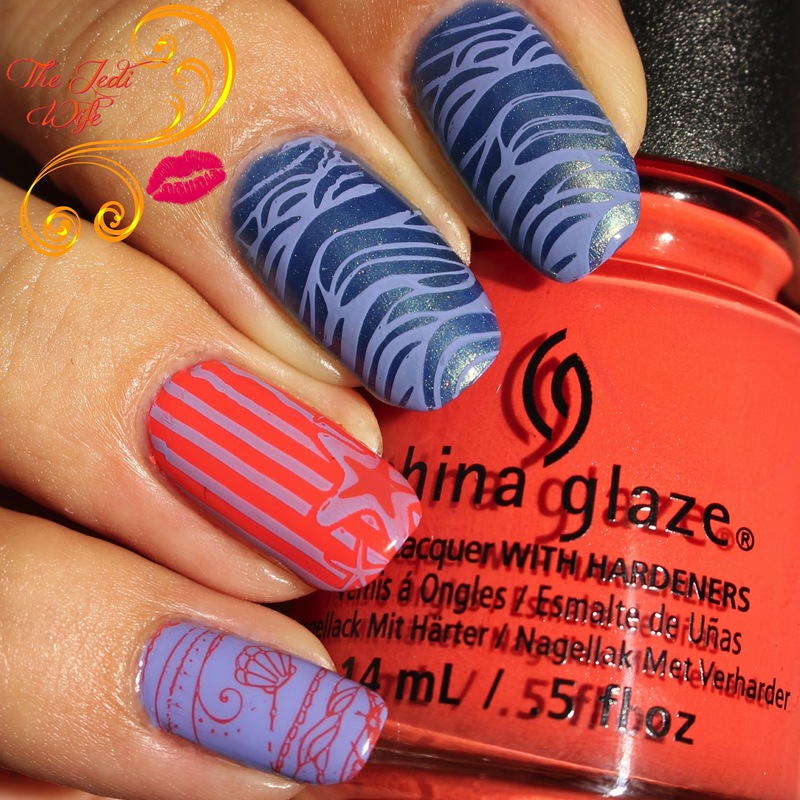 In my previous post, I shared two nail art designs I created using the China Glaze Seas and Greetings Collection. China Glaze went with a different take on the winter and holidays this year, and while it may not be for everyone, I personally love anything beachy so I think it's great. I have two more looks to share with you today; let's check them out! First up, with a "seas" and greetings collection, I NEEDED a look reminiscent of the ocean. I naturally had to check the stamping qualities of the China Glaze creams, and I am happy to report that they stamp really well! I wanted this look to capture some of my favorite things about a beach vacation from collecting shells on the beach, sunbathing, and just watching the movement of the water. I also used MoYou London stamping images from plates Sailor 05 and 06 and Born Pretty Store BP-23. The Seas and Greeting Collection is a lot of fun to play with, especially since depending on the combination of colours you use, you can get a very different "feeling" for your nail art. I went ultra-feminine with my second look for today's post. Check it out! While I'm not generally a huge fan of incorporating hearts into my nail art designs, I do like this look of hearts on my accent nail paired with the simplicity of the overall design. Colours used: Let's Shell-Ebrate, Seas and Greetings, and Eat, Pink, Be Merry. The Seas and Greetings Collection consists of 12 polishes, and only 6 of them are available for is purchase at Sally's stores. The complete collection is available for purchase online at Sally Beauty. Please note this collection is not available for purchase at Ulta. What do you think of these two designs? Do you have a favorite between these and designs in my previous post? I'd love to hear from you! The dark purple base is my favorite shade of all of these so I like that combination best. All look great though. I love the lavender and red stamping on the pinky! I actually like the heart mani the best ! I love your beachy mani! It's such a good, unique color combo. Oh my goodness, I love the heart manicure -- so fun! I love the way that purple glows against the pink. Great pairing! OMG these are fantastic! Glad to hear some of these stamp too, I never would have thought to try them. Thanks for reminding me that I NEED to play with these shades before Christmas gets here! Gorgeous manis! I love love love those seashells! I love the heart look, I am really digging this collection! Your nail art is so pretty. the art makes this collection. I love your first, ocean manicure - especially your ring finger! It looks awesome! 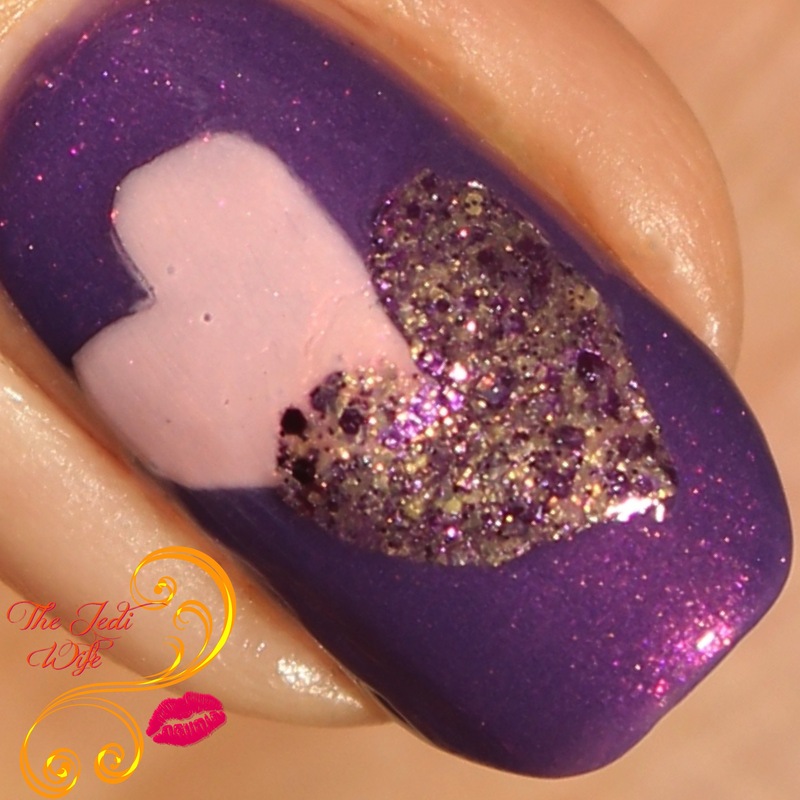 I adore the pink and purple heart mani!